OnePlus is rolling out the first official Oxygen OS 2.0.1 OTA Update for Oneplus 2 Android smartphone. The new official update comes with lots of fixes like OS 2.1 Fingerprint Issues Fixed, Photos Zoom Fixed etc. The OTA update is started rolling out and most of the Oneplus 2 users updated their phone with the same, but some of them are still waiting for the update for their OnePlus 2. 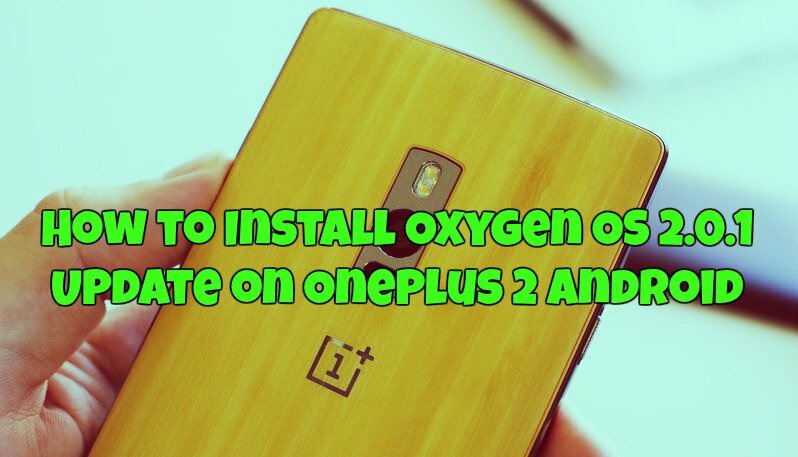 Here in this guide we’ll show you how to manually install the Oxygen OS 2.0.1 Update on OnePlus 2 Android smartphone. The full ROM weighs at 1.1GB whereas the OTA is at 40MB. It’s up to you which method you use, you can also flash the Full Rom or the OTA update on your phone. The process is very simple and takes a few minutes to update your phone. To get this update, you phone should be on the Stock Recovery. If you are using the custom recovery like TWRP, then go back to the Stock Recovery and follow the below mention steps on your phone. And yes do take the full backup of your Oneplus 2. Step 2. Once the ZIP file is downloaded, connect your phone to the PC with USB cable and move the zip file on your phone’s internal memory. Step 3. Boot your OnePlus One into recovery mode. See here how to do that. Step 4. Once the Oneplus 2in stock recovery, use the Volume button to navigate to ‘install update’ and press the Power button to select it. Step 5. Browse for the zip file that you saved on Step 2, select it and confirm installation. Step 6. Now the flashing process will start in your phone. If you will get the Error with OTA zip file, then try the FULL ROM package. Step 7. Once completed, select Reboot system now to reboot the phone. Now your phone will reboot and first boot will take 5 to 10 minutes to apply the changes on your phone. Now your Oneplus 2 is running on the latest version of Oxygen OS 2.0.1. I have problem…my phone stuck on ‘android Is Starting’….and repeat the same processes every time ? ?….is there any solution for this problem??? Good day. As suggested in the article, initially I had downloaded the OTA and tried to install the OS update but the installation failed. Then I have downloaded the full ROM but still installation failed. My One Plus 2 is functioning perfectly normal but I am unable to install update in anyway. Any effective suggestions will be highly appreciated. Thank you. In a recovery mode, I haven,t any option anywhere to apply an update. If I choose install from SD and go to the selected folder with the update, I can’t go any further. Why the opposite as described in all the tuto? How to update an iPhone: 1.Click update. 2.Phone restarts. 3.Done.